King Hezekiah was concerned, but not distraught. The Assyrian army, notorious for its brutality, was cutting a path through Judah. King Sennacherib had conquered Judah’s fortified cities, including the supposedly impregnable city of Lachish, and the path was now open for his army to fall upon Jerusalem, the crown jewel of the Judean kingdom. Judah’s king knew what he needed to do. According to the biblical narrative, he immediately “rent his clothes, and covered himself with sackcloth, and went into the house of the Lord” to pray (2 Kings 19:1). King Hezekiah knew he needed to connect with God. But he also knew that to do so, he had to connect with God’s prophet. The king summoned Eliakim, his chief of staff. He commanded his servant to dress in sackcloth and to seek the counsel of “Isaiah the prophet the son of Amoz” (verse 2). But King Hezekiah did not accomplish all this single-handedly. The biblical books of Kings, Chronicles and Isaiah show that the key to Hezekiah’s success was his extraordinary relationship with Isaiah the prophet. Isaiah was as much the protagonist in Hezekiah’s story as the king himself, and the remarkable renaissance the kingdom of Judah enjoyed during the eighth century was a direct result of this special king-prophet alliance. In December 2015, archaeologist Eilat Mazar announced that she had discovered proof of King Hezekiah. The evidence came in the form of a clay seal impression, or bulla. This sensational discovery generated a lot of international attention, and rightly so. To this point, however, there has been no known archaeological evidence proving the existence of King Hezekiah’s chief counselor and the unsung hero of ancient Judah’s eighth-century-b.c. rebirth, Isaiah the prophet. The Hezekiah bulla was unearthed in 2009, during a small excavation on the Ophel. The Ophel is situated adjacent to and south of the southern wall of the Temple Mount and has been the location of multiple archaeological excavations since 1968 (see map). The dig occurred in an area adjoining the ruins of what archaeological evidence suggests was once King Solomon’s royal bakery (see diagram). Discovered in 1986 and dated to the First Temple period, the ancient ruins contained pottery, including multiple enormous clay jars (pithoi) inscribed with Hebrew text showing they belonged to the royal bakery. Imagine a baker or palace worker 3,000 years ago tossing litter out the bakery window. Dr. Mazar’s 2009 excavation occurred at the foot of the southeast wall of the bakery, in the area where the debris would have landed. The excavation was small, but it furnished a treasure trove of ancient artifacts, including pottery fragments, ivory inlays, figurines, and lmlk seal impressions on jar handles. (In ancient Hebrew, lmlk means “belonging to the king.”) Mazar and her team also unearthed 34 bullae—small clay seal impressions stamped with the name of their owner. Thirty of these bullae bore Hebrew names. 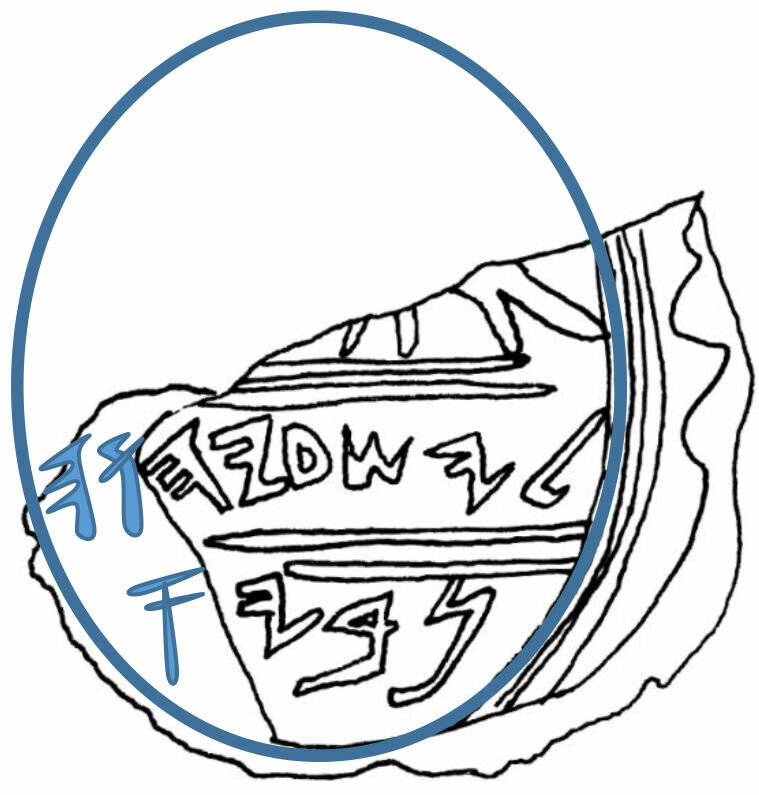 The Hezekiah Bulla which Dr. Eilat Mazar discovered during the 2009 Ophel excavations. This was the seal impression of Judah’s greatest king after David. 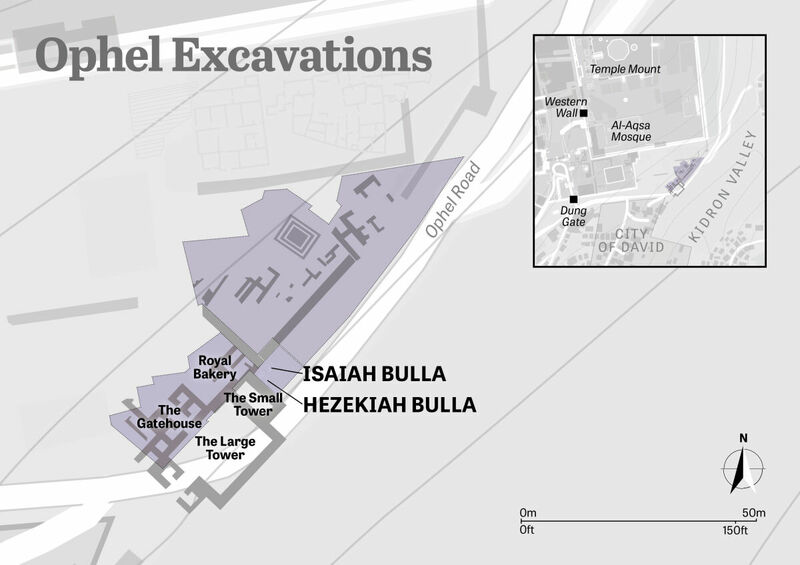 The Hezekiah bulla was a historic and extraordinary discovery. Dr. Mazar called it the most important individual discovery of her career, which is quite a statement, considering she has also uncovered King David’s palace, Solomon’s royal complex, Nehemiah’s wall, and a golden medallion featuring a menorah from the seventh century a.d. The discovery of the Hezekiah bulla was the first time ever that the name of a Judean king had been unearthed in controlled scientific excavations. Dr. Mazar didn’t know it at the time, but lingering among the other 33 bullae, awaiting its turn under her microscope, was another extraordinary discovery. When Dr. Mazar first read this inscription in 2014, she was instantly intrigued. Yesha’yahu is the ancient Hebrew name for Isaiah. Naturally, this caused her to wonder: Was this the seal impression of Isaiah the prophet? As electrifying as this thought was, Dr. Mazar suspended judgment. Speak with Eilat about archaeology even for a few minutes, and there’s a good chance you will hear her say something like, “We must let the stones speak.” Dr. Mazar is a scientist, and like every great scientist, she believes it is her job to follow the facts. Dr. Mazar studied the bulla extensively. She showed it to colleagues, including Prof. Shmuel Ahituv and Dr. Haggai Misgav, two distinguished epigraphists and experts at decrypting ancient Hebrew inscriptions. Even though it is tiny (roughly 1 centimeter wide), this bulla is chock-full of history. It can be divided into three zones, or lines. A significant part of the upper zone (first line) is missing, and the bottom left side is damaged. The damage was caused by a finger crushing the soft clay when the seal was fashioned almost 2,700 years ago. (You can actually see the fingerprints.) The fact that part of the bulla is damaged makes decoding it a challenge. Despite the damage, however, the text that remains is in excellent condition and easy to read. The most interesting part of the bulla—the text identifying its owner—is inscribed on the second and third lines. The text on the second line is easy to read and clearly states, Yesha’yah[?]. Although one letter is missing on the left side (Hebrew is written from right to left), there is only one viable option for its identity. In order for it to be a name, it must be a “u” (Hebrew vav). With the necessary “u,” this is incontestably the Hebrew name Yesha’yah[u]—or Isaiah. The critical question is: Is this Isaiah the prophet? The Bible mentions seven individuals named Isaiah, and other men named Isaiah undoubtedly lived in ancient Judah. Although this name was common, it was rare for an individual to have his own seal. Generally, only important figures—royalty, high officials, priests and prophets—had their own unique seal impression. So whoever this Isaiah was, he was unquestionably an important figure. A lot of the mystery with this bulla ultimately revolves around its damaged left side, and specifically the inscription on the third line. It is impossible to know for certain whether the word on the third line is complete or it is missing a letter. Dr. Mazar believes it is missing text and is therefore incomplete. There is clearly a border around the outer edge of the bulla. The text and motif are positioned inside this border. But notice, there is no border on the left side of the bulla, due to the damage sustained when it was created. If we imagine the existing border continuing around the entire outside edge, we can visualize where the border would be had the left side not been spoiled. On the left side of the bulla, between the last letter and the imaginary borderline, there would be ample space on the second line for at least two more letters, and ample space on the third line for at least one letter. Finally, imagine if there was no text (or at least a symbol or motif) filling the vacant space on both the second and third lines. Without a letter or symbol in this space, the seal would look asymmetrical, unbalanced and incomplete. It would look odd. But what about the missing text on the third line? Can we know what letters might have existed in this space? First, consider the three Hebrew letters that are present and can be easily deciphered. These are the Hebrew letters nun, vet and yod; together these form nvy. This word is not found in the Bible or in the Hebrew language. Of course, this does not mean the term did not exist. Prof. Shmuel Ahituv has studied the seal and suggests that nvy could be a surname, or may refer to a resident of the ancient Judean region or city of Nov (“Nob” in English). Dr. Mazar believes the more likely explanation is that the inscription is missing letters and is incomplete. If the second word is a name or surname (perhaps with an added letter), as Professor Ahituv suggests, the inscription does not identify the owner’s occupation, title or place of origin. This would be unusual. Dr. Mazar suggests the most likely and natural option for the missing letter is an aleph (‘). The addition of an aleph on the bottom line would create nvy’—the Hebrew word for prophet. To the Hebrew ear, the word nvy—even without the aleph (which is silent)—naturally sounds like prophet. Imagine hearing a friend read an ancient coin that said “Kin Richard.” Most people would naturally hear “king” and conclude that the coin was referring to King Richard even if the g in king was missing. It’s the same in Hebrew with Yesha’yah[u] nvy, the term inscribed on this bulla. When you read (and say) nvy, you naturally hear “prophet” even though nvy is missing the aleph. This is why nvy’ is the most natural explanation for the incomplete word on the Isaiah bulla. In archaeology, context matters. When examining an artifact, the material surrounding the item plays a crucial role in determining and verifying its proper identity. For example, if the surrounding material dates to a particular period, then it is likely the artifact can also be dated to that period. The ruins and artifacts surrounding the Isaiah bulla have been conclusively dated to the First Temple period (in archaeological terms, Iron Age ii). We can know with certainty that the Isaiah who owned this seal lived in Jerusalem between the ninth and seventh centuries b.c. The Prophet Isaiah lived in Jerusalem in the eighth century b.c. But in this instance we have even more archaeological context. The Isaiah seal was uncovered at the same time (2009) and in the same assemblage (collection of bullae and other artifacts) as the Hezekiah seal. It was discovered just a few feet from the Hezekiah bulla, and in exactly the same strata of soil. Dr. Mazar, in her article for Biblical Archaeology Review, noted the discovery of the Isaiah bulla just a few feet from the Hezekiah bulla and asked how likely it is that this bulla could belong to an Isaiah other than Isaiah the prophet. To me, she wrote, this is a “surreal scenario” (emphasis added throughout). When you consider the various explanations and the probability of each, it is hard to imagine this seal belonging to anyone other than Isaiah the prophet. The “chances of it belonging to any other but the known Prophet Isaiah are extremely slim,” wrote Dr. Mazar. When studying the archaeological context of an artifact, it is also important to consider the overarching storyline or narrative of the artifacts or ruins around it. If the assemblage is reasonably homogenous, meaning the artifacts all date to the same period, then together they will often tell a story. Depending on what is uncovered, the assemblage can provide a glimpse into the political, cultural or religious environment of the time. If the archaeological context in which an artifact is uncovered has a distinct theme, then it is likely that the artifact was part of that history. What is the archaeological context of the Isaiah bulla? Does it have a theme? Can this theme provide insight into Isaiah’s identity? The Isaiah bulla was uncovered within a collection of artifacts (bullae, figurines, lmlk seal impressions) that dated to the First Temple period. 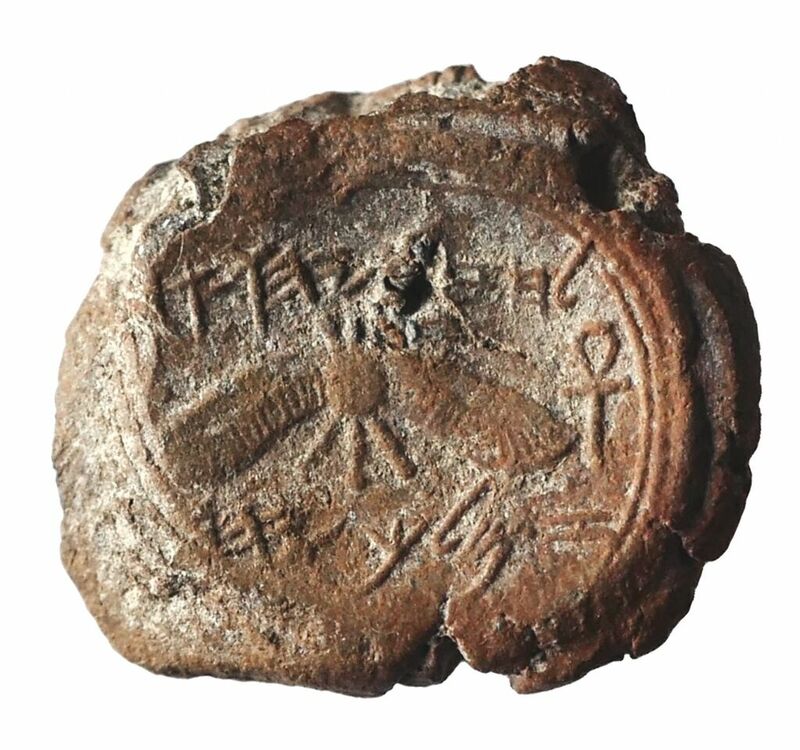 Of these, the most dramatic and enlightening discovery was undoubtedly the Hezekiah bulla, and this seal provides valuable insight into the identity of the Isaiah bulla. The Old Testament record provides a thorough account of Judah’s history following the death of King Solomon in the latter half of the 10th century b.c. This history is marked by political instability and failure, social and cultural degradation, and religious confusion and rebellion. Ancient Judah’s downward spiral was led by Judah’s kings, many of whom rejected God and lived idolatrous lives. Many, but not all. King Hezekiah was among the handful of exceptions. In fact, he was the opposite of Judah’s rebellious monarchs. Hezekiah inherited the throne of Judah when he was 25 years old and ruled for 29 years. The Bible recounts that he set about reforming Judah the day he took office: within a remarkably short period, he had rid the kingdom of paganism, reestablished God’s law as the supreme law of the land, and raised the ruins of King Solomon’s temple. King Hezekiah’s dramatic actions produced that famed renaissance in Judah: The kingdom thrived politically, financially and culturally in a way it hadn’t experienced since King Solomon. You can read this history in 2 Kings 18-20, 2 Chronicles 29-32, and the book of Isaiah. 2 Kings 18:5 says King Hezekiah “trusted in the Lord God of Israel; so that after him was none like him among all the kings of Judah, nor any that were before him.” The Hezekiah seal invokes the life and work of the greatest king since David. This historical context is important because the biblical passages documenting King Hezekiah’s life and work show that Isaiah the prophet was instrumental to his success. Other than King Hezekiah himself, the Prophet Isaiah was the most important and influential figure in the national revival. In fact, on those occasions when Hezekiah relied on Isaiah’s counsel, the prophet was the most influential figure in the nation. In 2 Kings 19, King Hezekiah responds to the threat of Assyrian invasion by praying earnestly and then dispatching servants to seek the counsel of “Isaiah the prophet the son of Amoz.” 2 Kings 20 records that King Hezekiah was struck with a fatal illness and that the prophet communed with the king in his private chambers. Later in this same chapter, Isaiah visits Hezekiah again, this time with a message of correction. Hezekiah and Isaiah were more than just contemporaries. Outside of King David and the Prophet Samuel, this is the most influential and productive king-prophet relationship in the Bible. Whenever Hezekiah faced crisis or needed counsel, he turned to Isaiah. And the prophet, inspired by God, guided King Hezekiah—and all of Judah—through the crisis. 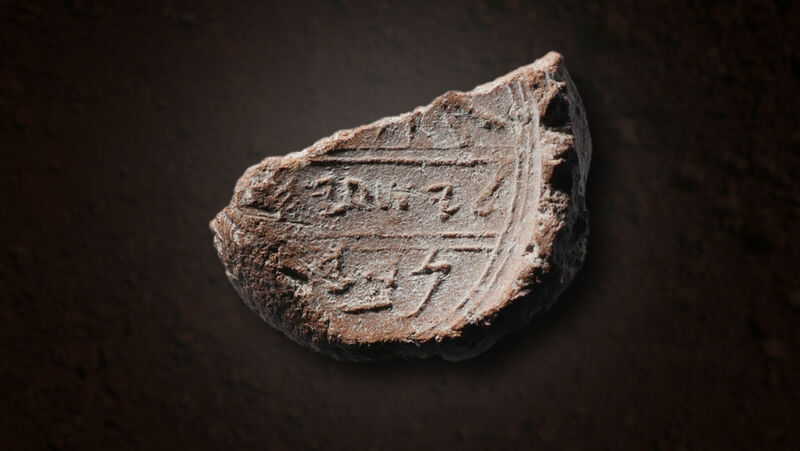 Consider this history and ask yourself: How likely is it that a bulla discovered within a few feet of King Hezekiah’s bulla and inscribed with the name Isaiah belonged to a man other than Isaiah the prophet? Like the Hezekiah bulla, the Isaiah seal provides all humanity with a rare and wonderful opportunity. It brings to life some of the most extraordinary and inspiring history in Scripture. The history of King Hezekiah and the Prophet Isaiah is a story of ancient Judah’s repentance, redemption and national salvation. It is the story of how God, through a remarkable king-prophet alliance, saved a city and its people from terrorism, war and conquest. And for some—sadly, too few—it is a story replete with lessons for today.